What is in the mysterious Egyptian casket that links murderers over a thousand years? 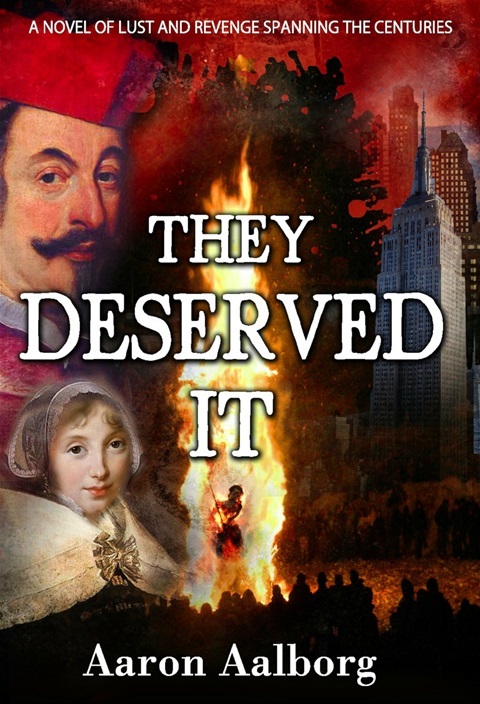 Our thriller begins as a historical novel set in 17th Century Italy, a time of superstition, plagues and cynical exploitation of young women. This ripping yarn of illicit love, hundreds of poisonings, the Inquisition, torture and witch burnings is built around true events. Characters include, beautiful young girls oppressed by dynastic marriages to aged husbands, a handsome and tormented young priest, Machiavellian cardinals and a scheming, atheist pope. In the second part of our story, the descendents of some of the original characters are driven to fulfill their ancestral destiny in modern day New York. The results include grisly killings, global pursuit, international espionage and a thrilling climax of mass murder, authorized by the President of the United States. It is up to you to decide which of the victims deserved their fate. "They Deserved It," is available on Amazon in gigital and print. Buy it here. Setting the scene for the excerpt from Chapter 14 Escapes and Captures. La Spara has led a group of women and helped them to poison their husbands. Now she is on the run, hotly pursued by the forces of Cardinal Archbishop Filomarino of Naples, acting on the orders of Pope Alexander VII. Cardinal Filomarino was beside himself with anger. Pope Alexander should have let him act sooner. Several things were going badly wrong. La Spara had disappeared without trace. Father Gianni was nowhere to be found. Now a significant part of his moneys had been stolen, presumably by Catherina. He dearly wanted to get his hands on her. There would be no convent for her this time. He raged at and demoted the captain of his guard. He had the guards who were supposed to be watching Catherina cast into a dungeon. He would see if they had conspired to steal his belongings later. He doubled the watches at all the ports down the coast and offered a huge reward for Catherina’s capture. Catherina had changed identity again a short walk outside the city walls. She had paid off an attendant and left the coffin in a hedge. Now, she was dressed as a rotund, middle aged governess. She carried references to a new employer in Pavia in Lombardy. This was not too far from Brescia. She expected that any pursuers would least expect her to head back in that direction and would be focused on the ports. Her plan worked well and no one questioned her on her way. “There are house to house searches. There is a reward of gold coins for your capture. Your accomplices are already being tortured. They are admitting murder and much else. The rumor is that signed confessions were found in your house. You have been identified as the ringleader. You must leave here right away. You are a danger to me and my family”. To put steel into the man, she reminded him. He was only too glad to be rid of her, as he ushered her through a deep shaft that led beyond the walls of the City. As she reached the far entrance, hidden by a stone and some bushes she turned to him and gave him a disarming smile. She held out a hand to him. As he grasped it in farewell, her razor sharp stiletto slipped between his ribs and into his lung. She shut the hidden door and left him drowning in his own blood, which bubbled from his lips. He lay sprawling in the secret passageway. His body was never found. In Rome, the Pope interrogated Anna, who had been sent to him, as he had instructed. She held out for a long time, despite being racked repeatedly. Her arms were pulled from the sockets and the ligaments parted in her knees. Alexander ordered that water be pumped into her, until she nearly drowned. She was then revived and the process repeated. After only four repetitions of this horror, she confessed everything. Alexander’s experience as the Grand Inquisitor in Malta had taught him that the acute chest pain and sense of imminent drowning were far more effective than many of the more spectacular and elaborate tortures at his disposal. This water torture left no physical external marks. On occasion, this feature could be useful and avoid accusations of unnecessary cruelty. When Anna confessed, the Pope was especially interested to hear of the involvement of an old enemy, Cardinal Archbishop Litta of Milan. He always thought of his repulsive hairy hands. They had had a bitter struggle for the Papacy, which Cardinal Litta had lost. It was Alexander who had won the crucial support of the Spanish King, as a result of a substantial payment from his Chigi relatives. As Cardinal Litta was a member of the Governor of Milan’s entourage, Alexander needed to proceed against with extreme caution. As in everything, Alexander proceeded at a measured pace and with detailed planning. Litta was carried, ill and unconscious, from a formal dinner hosted by a trusted papal nuncio. Litta never recovered. Anna was of no further interest to Alexander. Her stretched and twisted body was dragged to a deep corner of Castel Sant'Angelo. This fortress was connected by an overhead passageway to the Vatican. It was a place of refuge for popes when the Vatican was attacked or when there was rioting in the streets. The popes could run to the safety of the fortress, through the overhead passageway, right over the heads of the mobs below. The jailers set down bread and water beside Anna, slumped in the far corner of a deep cellar. She screamed helplessly, as she watched the masons begin to build a wall of heavy stones between her and the doorway. As stone piled on stone, through her broken mouth, she begged the implacable guards to have mercy on her. Her screams were finally muted, as the last stone cut off the sight of her face, aged and disfigured by torture and now twisted and distorted in terror. La Spara was brooding and in hiding in a nearby convent. Fortunately, she had made many donations to various charities and religious houses, as an insurance against events such as these. Now she could find relatively safe refuge with the nuns in a choice of several convents. Her enquiries about her daughter, Anna, indicated that she had been taken and was in the hands of the Pope in Rome. This was a disaster, as Anna knew almost everything of her affairs. Thinking on her situation, La Spara was incandescent with frustration and anger. She had paid off or had a hold on many important men in Naples. She was supposed to have had the protection of Cardinal Archbishop of Milan, Litta. How could all this have happened? When news of Litta’s death came to her, she relished the moment. That was his just reward for not protecting her! She fumed on, thinking that most of her women clients were too important to be trifled with and had the highest connections. How could this have happened without her knowing about the threat in advance? It would be some weeks before she concluded that she had been betrayed by the Contessa De Brescia who, her sources said, seemed to have disappeared. Meantime, she had lost much of her fortune when her city villa was taken, but she was too cunning to have kept all her eggs in one basket. She had more than enough money to bribe her way to her various destinations. With good reason, La Spara became extremely paranoid. Over the following weeks, she constantly eluded arrest, sometimes with only minutes to spare. She frequently changed her appearance and name. She became difficult to meet with and avoided several traps and ambushes set for her. She continued to sell her slow poisons and to build back her fortune. She pretended to be very religious and spent much time at her various convents, where she distributed more money to the sick and the poor and made sure that the nuns saw her devotion to prayer. She cultured a reputation as an unfairly persecuted, holy woman, whilst plotting revenge. Cardinal Filomarino was feeling terrible. He had awful cramps in his stomach and his doctors despaired of him. As he lay dying, with his bowels and stomach on fire and his brain clouded by ineffective painkillers, he suddenly realized that La Spara had somehow tainted his food. With his dying breaths, he groaned orders. His personal servant and his cook were dropped through the top of a bottle shaped cell in his deepest dungeon. This was called the oubliette, meaning ‘to forget’. There was no light down there. The cook had broken an ankle in the fifteen foot drop onto the stone floor. Bread and water were lowered down for some weeks thereafter. They had to fight the rats and each other for it. The guards heard the men’s screams and curses, as well as scurrying and loud squeaking coming up from the blackness. Eventually, there were no more pleadings of innocence, just a putrid smell and only the scurrying of the rats to break the silence from the oubliette. The nuns could not and would not accept that their holy benefactor was a notorious murderess. She remained inside the convent, with troops permanently camped outside for several months. Finally, the Pope’s patience expired. He threatened to excommunicate all in the convent and to disband the order, unless she was given up. Artillery was prepared to give weight to these threats. The Pope had tired of the affair by now, leaving it to his nuncio in Naples to finish with the matter. 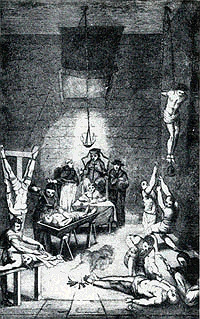 For several days, the nuncio slowly descended the steps time and again to where La Spara was held in the torture chamber. He took revenge on behalf of Alexander, who had been his lover when he was a young priest. He prescribed many tortures, out of spite, rather than to get a confession. On the very first day, she had confessed to witchcraft and over six hundred and fifty murders. She gave the names of all the conspirators and agreed to the many others, who were added by Papal request. La Spara too suffered the water torture. Soon she was a broken wreck of a woman, scarred and gnarled like an old hag, exactly how the Church liked its witches to look.